We sat at the breakfast table with Todd and Norman earlier in the year, one a very good friend, the other a successful film director who we as a family have now spend several wonderful occasions with. They asked some very tough questions as to our motivation for an event like Mysterious? They were concerned at the potential emotional pain if the event was a flop and asked for us what were the measures of success? Were we emotionally in a place to organized such an ambitious program? I can see from the other side of the table the legitimate concern that “we have not let Mike go”, “we have not been able to move on”. In response to Todd and Norman, I said, “I want to leverage Mike’s story”. From my perspective I ask myself the question, “Do I allow unwanted events in my life to be a setback or a springboard?”. For me, to answer that, I have to have thought through my over-ridding life purpose or passion, and to me that is clear. For the past 33 years I have given my life to “telling people who know they are sick about a great medicine”, or “telling people who enjoy a fine wine about this awesome wine I tasted and I so recommend it to them”. When I experienced the amazing love of the Father at 19, it set me on a path. I am convinced to the point of passion that John 3:16 “For God so loved the world that He gave His only son to die for us, so that whoever believes in Him should not die but have eternal life” is a life transforming knowledge that has to be shared. When you experience, not know, the daily mercy, grace, love and glory of the Father, then it changes you from the inside out. I have experienced being both totally distraught and in the same breathe totally at peace, weeping and happy at the same moment, feeling so guilty but experiencing forgiveness, anxious and calm in a moment, this is what I want to tell about. At the same time there are days I don’t feel a thing, God seems so distant. All a part of the journey! Do I allow Mike’s death to set me back or do I use it as a springboard to leap forward again with my passion and purpose to tell all who I can about the Fathers Love? I pray for more springboards along the journey, not painful ones mind you! 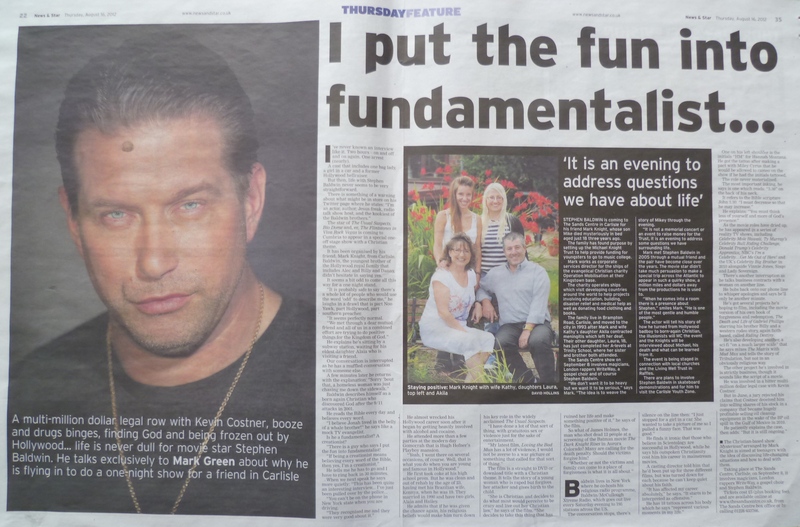 Latest Article in News and Star…..another springboard! This entry was posted on Wednesday, August 22nd, 2012 at 7:12 am and is filed under Uncategorized. You can follow any responses to this entry through the RSS 2.0 feed. You can leave a response, or trackback from your own site.